What is the particle size range (in terms of micrometer or nanometer) measured by these devices and how are the size bins are classified? The parSYNC® measures and transmits absolute response of three particulate sensors (plus three gaseous sensors in parSYNC® PLUS). The sensors are sensitive to different size fractions; ionization to finer particulates (up to 0.4-0.5 microns), scattering to intermediate sizes (greater than 0.3 microns to 2-5 microns) and opacity which responds to a wide spectrum of sizes, mainly coarse/large particulates. Multi-plex post-processing maps the response of the sensors to provide size relationship data. Since all three [(a) Opacity Sensor (b) ionization sensor and (c) scattering sensor] are used for measuring particulates, there will be a difference in sizing calculated by different techniques for the same particle. How then can the data of these three sensors be utilized together for arriving at the PSN (Particulate Synchronization Number). Where CONC is the output of the reference method; VO, VS, and VI are the opacity, light scattering, and ionization sensor response voltage outputs from the parSYNC®, t=-1, 0, and +1 are the sampling time increments relative to the measurement point, and f(…) is the fitting term. This procedure employs a similar step many commercial 1065 PEMS systems presently employ to align exhaust gas concentration and flow rate measurements when calculating second-by-second mass emissions. The step provides a significant improvement in particulate measurement accuracy and typically generates reference measurement agreements of the order of 95%. Based on specific customer requirements, particulate data output can be further developed for PM-10, PM-2.5 and PM-1. Do the parSYNC® and parSYNC® PLUS take power from the vehicle being tested or can they operate on battery also? The unit employs self-contained battery power; it can also utilize a vehicle’s standard DC outlet (if desired). Is the PM (particulate matter) calculated from the PN (particulate number) data using some density factor? If yes, how is the count data converted into mass data and what density factors are taken into calculations? 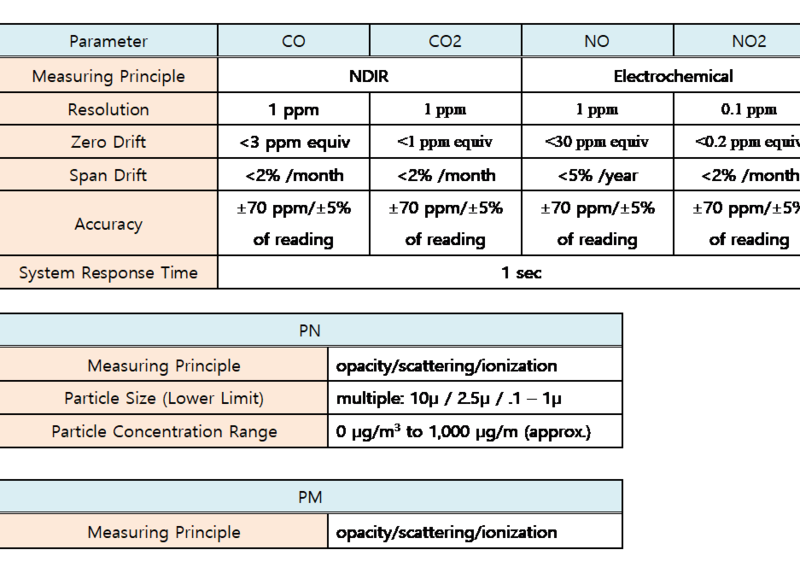 Particulate number output can be provided based on a pre-calibration to an existing PN standard. Mass flow can be obtained by adding a flowmeter or an OBD device, which can then be converted into grams/x (using a proprietary software algorithm). The parSYNC® PLUS also adds a GasMOD™ capability (currently (NO/NO2/CO2 (true NOx Speciation) & NOx/CO2/CO RDE) Sensor Cartridge(s). Are these electrochemical / infrared sensors and what is their average life span? In order to calculate mass (g/sec), flow rate has to be measured. I didn’t see a flow tube measuring flow rate in your file. Do you use ECU data instead? The parSYNC® is designed to accept either flow measurements from commonly available flow meters (3DATX does not manufacture flow meters at this time), ECU data, or an engine sensor array. These data are then combined with parSYNC® data to convert to grams/X. What is the measured data rate (1 or 5 hz?) and format type (*.csv?) of result data to see the result data stream? The maximum sampling/Update rate of the parSYNC® hardware is 200 kHz; however, the sample rates per each pollutant is typically 4+ hz and averaged out to one data point per second. In case of RDE testing, is it possible to have post processing? Follow Part 1065 or Reg 83? Yes – post-processing can be accomplished, as well as on-the-fly monitoring. The parSYNC® has been designed to follow Regulation 83, which is focused more on repeatability and accuracy, and allows for flexibility in sampling technique. US regulation 40CFR 86 Part 1065 (a-j) dictates specific sensor technology that is not conducive to a smaller lightweight design (such as parSYNC®) However, the parSYNC® has been tested against 1065 equipment (CARB, EU) with another such test being performed by SwRI/ERG/CRC next month. The available published results demonstrate that parSYNC® can provide an acceptable similar 1065 output with an R value in the range of .96 – .99, depending upon the pollutant. You use two replaceable cartridges; one is PM Sensor and the other is GasMOD. What is normal life spans? Dependent upon the environment of the testing, the particulate cartridge should last approximately 6 months or longer (This may not be true in a testing lane) We have some cartridges that we have been using for almost 1 year. The GasMOD™ cartridges should last approximately one year, again – depending upon the type of testing. What is a way to perform zero calibration? Two methods can be employed: a simple field check utilizing commonly available “smoke in a can” or a match will ensure that the triple-phase particulate sensors are properly responding; 3DATX has also developed a precision calibrator/generator device – CA/GE Unit, which utilizes a pre-programmed or customized algorithm to employ a HEPA filter/Ambient/Particulate sequence designed to perform zero calibration. We have found that the CA/GE Unit is most valuable to ensure proper calibration. In case of accuracy test, linearity check would be necessary. Do you use a reference device for the calibration?